After a night of explosions, gunfire and tanks rolling along the streets of Istanbul and Ankara, President Recep Tayyip Erdogan told Turkey Saturday that an attempted military coup was over and the government was in charge. At least 161 people died and another 1,440 people were injured across the country. 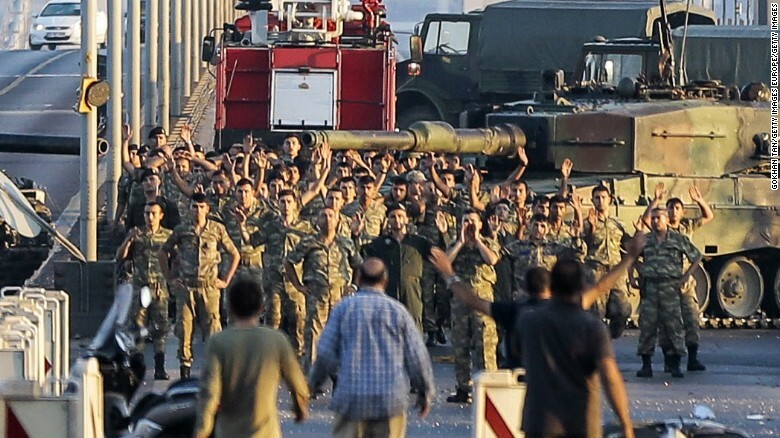 A total of 2,839 military officers have been detained, a source in the President's office said. Local authorities are preventing movement onto and off of the Incirlik Air Base in Adana, according to the U.S. Consulate in Turkey. Power to the air base has been cut and the Consulate warns U.S. citizens to avoid the air base until normal operations are restored. Turkey's High Board of Prosecutors and Judges has dropped the board membership of its 5 members and 2745 judges have been suspended from their posts, the Anatolian News Agency. 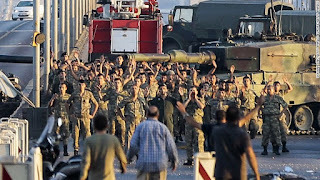 A Turkish helicopter carrying eight men landed in Alexandroupoli, Greece (close to the Turkish border), after issuing a distress signal due to a mechanical failure, according to a statement from the Greek government spokeswoman Olga Gerovasili. The men were met at the airport by police, the statement continues, and were taken to the local police station. At the police station, the men requested political asylum, and that request is being considered, according to the statement, which went on to say that the helicopter will also be returned to Turkish authorities. In light of the events unfolding in Turkey, British Airways has canceled all flights to and from the country on July 16, according to a statement from the flight operator. The statement adds that they are continuing to review flights to Turkey and that the safety and security of their customers and colleagues remains their top priority. This is an attempt against the nation in which a limited unit has taken over state's armored vehicles and arms in Istanbul and Ankara, and acted in a similar way to what happened in the '70s. Honorable Turkish nation; protect your democracy and serenity. I invite you to go out on the streets and to claim your nation against this narrow group' act which hopes to suppress the Turkish nation. Claim your state and your nation." #idamistiyorum ("I want the death penalty") has surfaced as the top trending hashtag in Turkey with 105K tweets and counting. "As you know there is no death penalty in Turkish legal system." "Today our parliament will have a meeting and we talk talk about what necessary measures should be taken in order to avoid a craziness like this in the future."